“Making contemporary music more approachable for everyone” is the artistic vision of the Turkish pianist Seda Röder. In addition to her podcast series Blackbox about New Music, she puts this vision into realization in form of lecture recitals and carefully chosen, coherent concert programs. Through numerous world premieres and workshops, Seda became known to audiences, critics, and composers alike as an engaging performer of contemporary music. Having a wide repertoire of solo and chamber music that ranges from Couperin to Stockhausen and beyond, Seda has performed frequently in Turkey, Austria, Germany, and the USA. „Making contemporary music more approachable for everyone“ is the artistic vision of the Turkish pianist Seda Röder. In addition to her podcast series Blackbox about New Music, she puts this vision into realization in form of lecture recitals and carefully chosen, coherent concert programs. Through numerous world premieres and workshops, Seda became known to audiences, critics, and composers alike as an engaging performer of contemporary music. Having a wide repertoire of solo and chamber music that ranges from Couperin to Stockhausen and beyond, Seda has performed frequently in Turkey, Austria, Germany, and the USA. As an Associate of the Music Department at Harvard University, Seda researches Viennese piano music from the contemporaries of Alban Berg and Arnold Schoenberg. Her debut album—inspired by her interest in scholarship and performance—brings together music of three centuries by composers who were active in Vienna: Mozart – Brahms – Berg. Before arriving at Harvard University in 2007 Ms. Röder graduated with distinction from the Mozarteum in Salzburg and worked intensively with the world-renowned Beethoven and Brahms specialist Gerhard Oppitz at the Musik Hochschule in Munich. In addition to her formal piano studies she focused on the study of period instruments and performance practice, explored orchestral repertoires as a guest student of Bruno Weil’s conducting class and attended master classes with András Schiff and Karl-Heinz Kämmerling. For her extraordinary artistic achievements Seda Röder was awarded several prestigious fellowships, amongst them grants from the Austrian Department of Education, the German Academic Exchange Program, the merit-based scholarship of the “Alumni Foundation of the Austrian St. Georg-Kolleg, Istanbul”, as well as the Richard-Wagner-Scholarship in Munich. Ms. Röder currently serves as a Teaching Assistant for Music History and Chamber Music at Harvard University. As an Associate of the Music Department at Harvard University, Seda researches Viennese piano music from the contemporaries of Alban Berg and Arnold Schoenberg. Her debut album—inspired by her interest in scholarship and performance—brings together music of three centuries by composers who were active in Vienna: Mozart – Brahms – Berg. Before arriving at Harvard University in 2007 Ms. Röder graduated with distinction from the Mozarteum in Salzburg and worked intensively with the world-renowned Beethoven and Brahms specialist Gerhard Oppitz at the Musik Hochschule in Munich. In addition to her formal piano studies she focused on the study of period instruments and performance practice, explored orchestral repertoires as a guest student of Bruno Weil’s conducting class and attended master classes with András Schiff and Karl-Heinz Kämmerling. 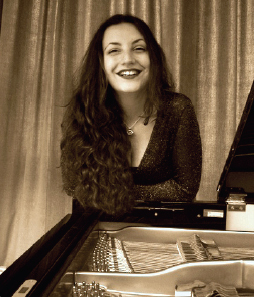 For her extraordinary artistic achievements Seda Röder was awarded several prestigious fellowships, amongst them grants from the Austrian Department of Education, the German Academic Exchange Program, the merit-based scholarship of the “Alumni Foundation of the Austrian St. Georg-Kolleg, Istanbul”, as well as the Richard-Wagner-Scholarship in Munich. Ms. Röder currently serves as a Teaching Assistant for Music History and Chamber Music at Harvard University.